I've left the trees "soft" so they will not draw attention away from the giraffe. Next I'll play with the foreground, saving the animals for last. While the raw sienna - burnt sienna turpentine wash gives me a starting point, now that I have painted the sky, the piece has direction. You can see the right side looks a lot lighter than the left. That is a function of my studio lighting. 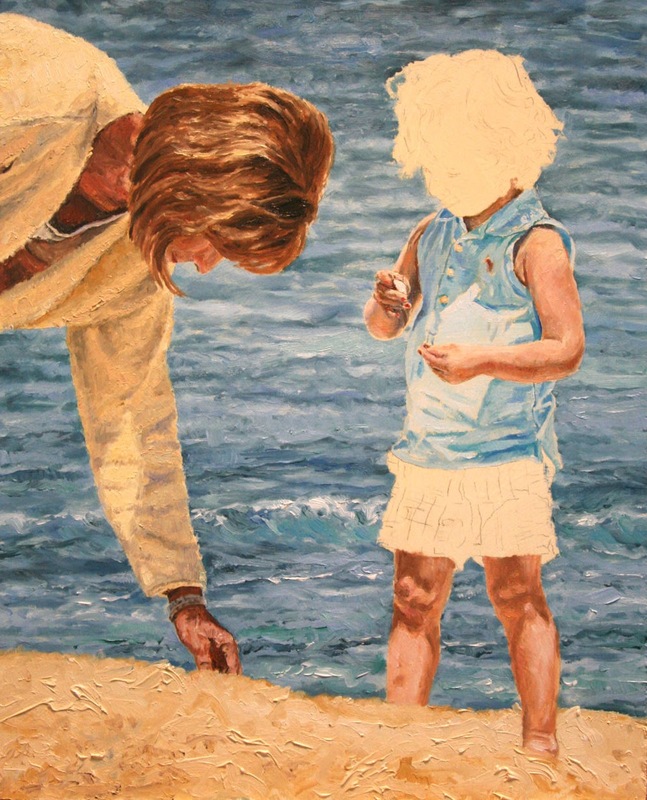 Even lighting across a painting this large is difficult unless I take the time to set-up a number of lights. I have wanted to paint a large giraffe piece. When I remembered the herd of giraffe I encountered near the Olduvai Gorge, often referred to as the "Cradle of Mankind", I had my inspiration. This painting measures 22" X 62." Here I have completed my raw sienna - burnt sienna wash and am ready to start on the sky. This piece﻿ was a lot of fun to do. A departure from my usual wildlife genre, it gave me an opportunity to stretch. I hope you enjoyed watching the progress and the decisions along the way. The first thing I did since the last blog was cool down my water. Rather than Cobalt Blue which I had mixed with Veridian Green, I swiched to Ultramarine Blue for the base blue. Fortunately, much of the oil paint for the water had dried so I was able to dry brush the cooler blue and remix some of the darker lines with a cooler tone. 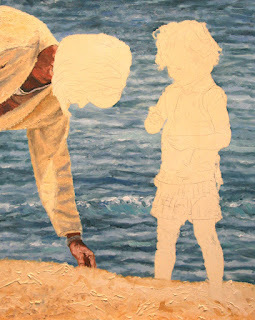 Since the last blog, I also worked on the child's left arm. It was looking a bit dull so I threw on some bright pinky oranges and added some of the color to her legs. Now the shorts. .......... Agggghhhkkkk? Who makes fabric like this and who designs clothing for it? I was almost tempted to put her in a nice basic color but one of the things which attracted me to the scene was these crazy shorts. As I was painting the first red stripes, a girlfriend called. Fortunately I can paint while talking on the phone (it has a very long cord). My friend told me a story which took hours and was a huge help. If I had had to sit and paint these shorts without a really good distraction, they instead might have become a nice green color! Guess I spoke too soon about the temperature. We have had a couple days hit the low 90's. This means some adjusted painting times. Without air conditioning, my second story studio tends to get a bit warm starting at 4 pm. One afternoon I took a break and went back over at 10:30 pm, opened all the windows and settled in for some painting. The gentle breeze encouraged by the cross-ventilation, plus music and much concentration meant it was 2:30 am before I knew it! I couldn't wait on the adjustments to the water and have repainted a lot of the lower section since the last blog. When something bothers me in a painting sometimes I can't do the sensible thing and wait before I start fussing with it. 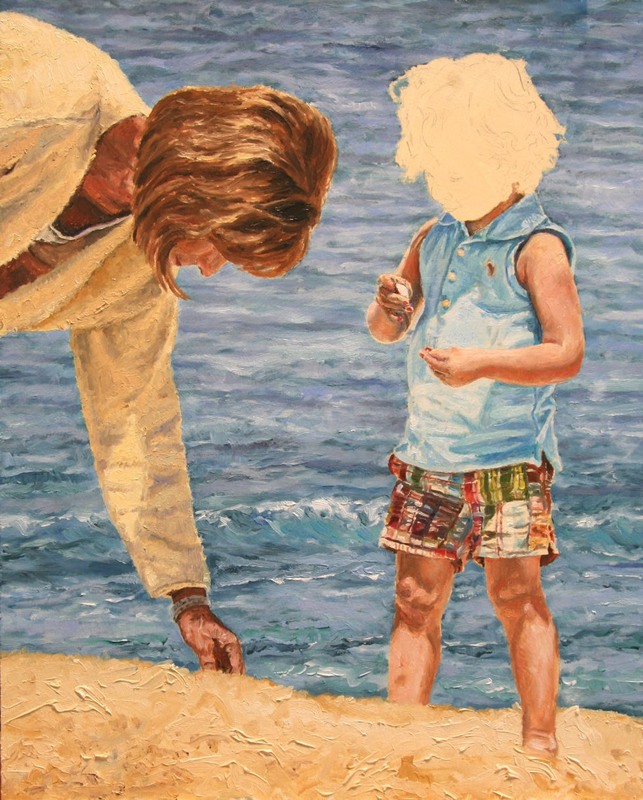 With some of the flesh colors already mixed for "Mom" I thought it would be a simple step to paint the child's legs. Wrong. The colors I was using weren't capturing that soft baby fat look. Once I hit on a mix of alizarin crimson and cadmium orange I was headed in the right direction. I like the color of the child's shirt but I see my water is too close to the same hue and needs to be cooler. Much of the country is sweltering right now. Here the thermometer has shot all the way up to .... 80 F. One of our warmest days of the year, so far. We are lucky as it is still getting into the 50's at night. With everyone thinking about the heat I thought it would be fun to do a "summery" piece. I have wanted to paint this for a couple years and have a hankering to do it now. I may play more with the water (might be a few too many "stripes" near the bottom). 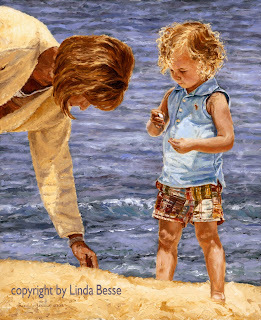 The edge of the water is over the slope of the sand so want to create that feeling. 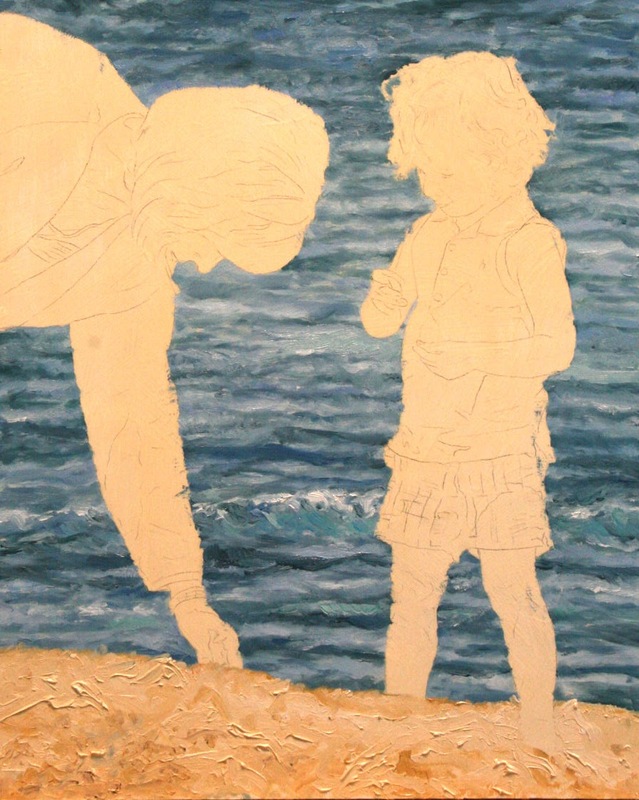 I'll need to finish more of the painting before I revisit the water. On to the people. I debated the color of the yellow sweater but decided to stick with it. 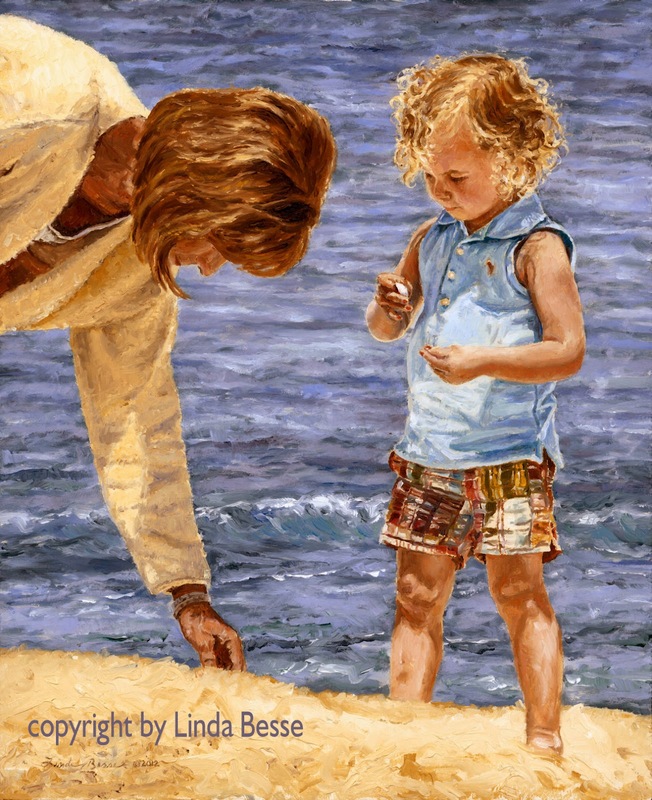 With all the colors I'll have on the child, the simple "sand" color may act as a good basic to draw attention to the little girl. After I decided on the yellow color, I found mixing the "right" yellow more difficult that I thought it would be. Various combinations of Naples Yellow, Cadmium Yellow Deep, Lemon Yellow, Titanium White, and Yellow Ochre were tried and set aside or mixed with other colors. Much of the "shadow yellow" is a purple with Ultramarine Blue and either Burnt Sienna or Cadmium Red Deep, lightened with Titanium White. Last weekend I started this piece at the Gun Dog Expo in Portland. I like working on paintings at shows and I find it easy to play with a lot of detail. In between my visits with clients and other vendors I pick up my paintbrush and work on a small section. This type of stop and go also gives me plenty of time to critically evaluate my work. By the end of the show, I was convinced the composition could be stronger. You can see I drew the man's head. 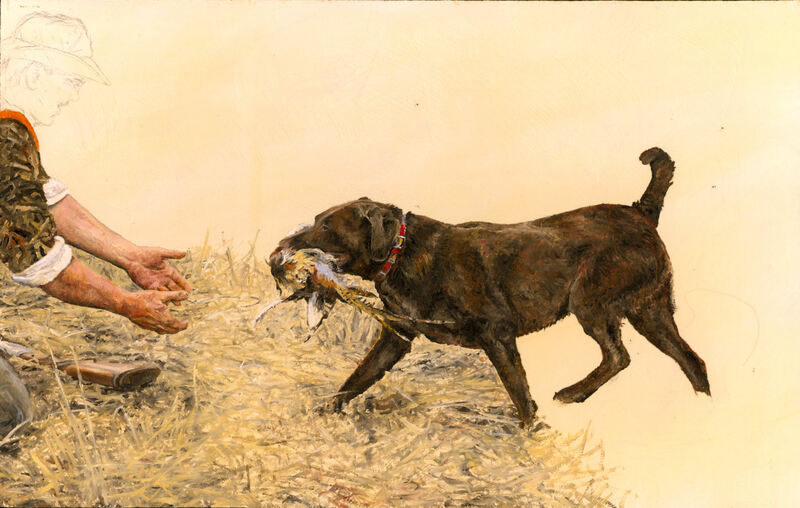 With the whole emphasis on the exchange of the pheasant from the dog to the man, the man's head will only be a distraction. It will draw attention because the viewer will look to see who it is. So I have decided to lob off his head. Before I rush to the guillotine (table saw), I am going to live with the painting for a little while. Do I leave the chin? the mouth? I need to be careful not to crowd the dog's tail. Because my substrate is untempered hardboard this adjustment is an easy task. Once I make my cropping decision, I'll post more of it in progress.